If you’re looking to go all in and enhance your already-existent “creepy loner” vibe, might we suggest perusing the items in the upcoming garage sale (or, to be more specific, barn sale) Southern California amusement park Knott’s Berry Farm is holding with Heritage Auctions? 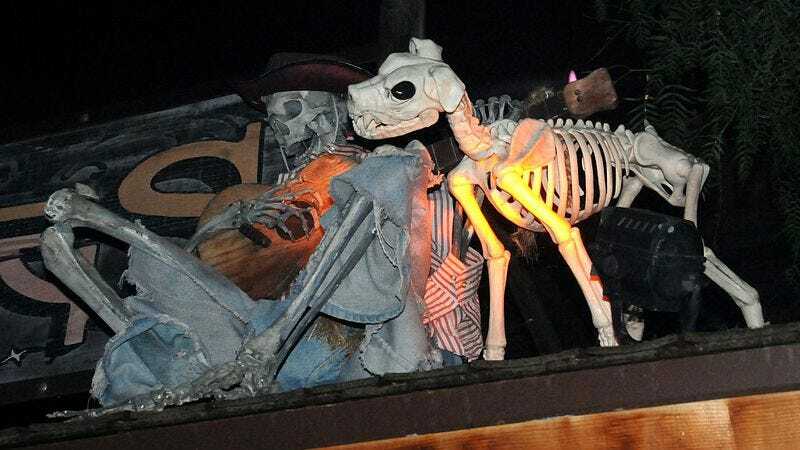 There, you can purchase leftover Old West mannequins, ride animatronics, a monster-truck hearse, a gigantic harlequin clown face, and many more creepy vintage artifacts that have been rotting in storage on the Knott’s Berry Farm grounds for the past few decades. As park spokesperson Diana Bahena tells local news affiliate ABC7, “It’d be nice to find them a good home, someone who is going to take care of them and keep up the maintenance for them and treasure them.” In other words, to treat them like the family you do not have, arranging them around the dinner table every night and laughing a little too loudly when their wigs fall off their lifeless heads and into their cold spaghetti and meatballs. (That’d be difficult to do with the monster truck, but you get the point.) Why, with that level of care and maintenance, you’ll be killing off the vanloads of horny teenagers who regularly stumble onto your property in no time. And then you’ll have lots of friends! Happy Valentine’s Day!